Promising one seat, fat tires and a “drag mode,” here is the Dodge Challenger SRT Demon in all its glory. This is a prototype that was caught testing in the Detroit area. 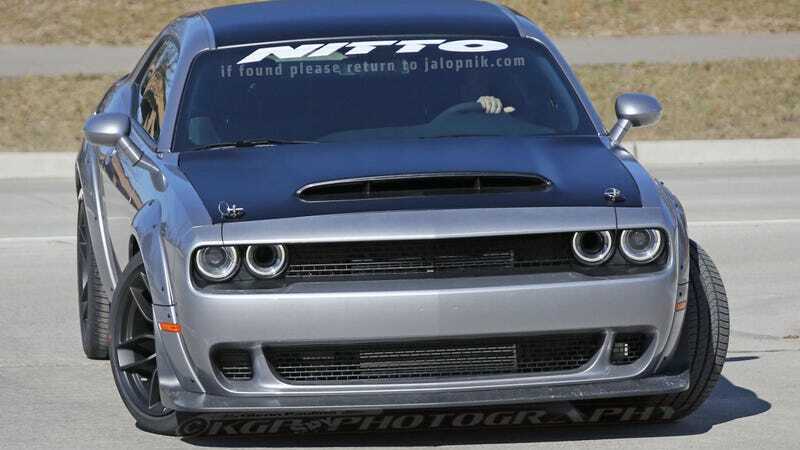 The hood scoop is massive and my God so are the front tires. We reported on the “Air Grabber” before—which will allegedly be the largest cold-air intake ever installed—but seeing it on the car gives it a whole new perspective. Curiously, though, this test car seems to have more than one seat in it. We still don’t have any power figures, but it’ll probably be a gazillion, at least, knowing FCA. Looking at these photos is way better than scanning those clips Dodge has been pushing out on YouTube, I can tell you this much. It should be noted that the car does look quite similar to the one in The Fate of the Furious, but the car Vin Diesel stood next to lacked hood pins like the test car has. Also, the fenders on this car appear to have fake (?) rivets and it is wearing a set of winter tires. We have reached out to Dodge for comment and will update if we hear back.